At 'Washington Post,' Tech Is Increasingly Boosting Financial Performance : All Tech Considered The newspaper struggled amid declines in print ads, but under Amazon's Jeff Bezos, it has transformed its operations, from how it writes headlines and chooses photos to how it generates ad dollars. Journalists at The Washington Post work in a newsroom surrounded by screens showing its website and updated reader metrics. 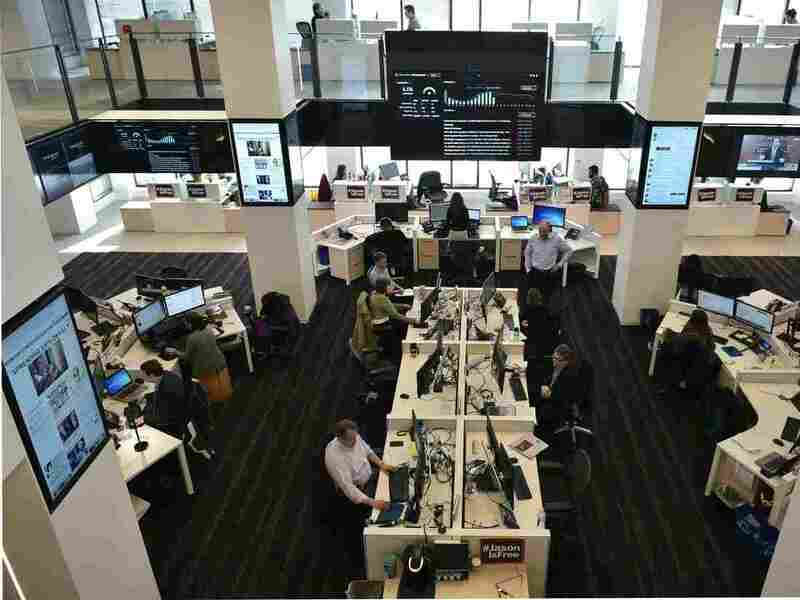 When I started my career at The Washington Post in the late 1990s, the newsroom wore a dusty, outdated look as if it were paying homage to its legendary past. The Post of today occupies an updated building on D.C.'s renowned K Street, in modern, glass-walled offices with a Silicon Valley aesthetic. This is the Post after Jeff Bezos, the Amazon CEO and e-commerce visionary, bought it in 2013. Since then, the paper's business and technology has almost outshone its award-winning journalism. Before Bezos, the Post was losing revenue and its losses were widening, as it struggled to find income to replace its decline in print ads. The Post is now privately owned and doesn't discuss specific figures, but says revenue and profits are up, as subscribers grow and digital ad revenue increases. Its monthly Web traffic has grown 56 percent, to 78.7 million over the past two years, according to ComScore. That reflects its journalism, but it also reflects big changes under the hood. Under Bezos, the newspaper has transformed its operations, from how it writes headlines and chooses photos, to how it generates ad dollars. Bezos came with deep pockets and a message, says the Post's chief information officer, Shailesh Prakash. "He talks to us a lot about not being afraid to experiment, to think long term," Prakash says. " 'Stop whining that the Web took publishing away from us, took our business model. It also brought new models,' " he says Bezos told them. Prior to Bezos, the Post's technology operation consisted mostly of a help desk, fixing computers and software-bug patches and such. After Bezos, and at his urging, the Post made a critical decision: to build its own software. "Pretty much every tool that the newsroom uses, or the sales team uses, has been built in-house," Prakash says. It nearly doubled its IT division to 250 people, Prakash says, recruiting high-quality talent by selling them on a startup-like environment and a creative mission to save journalism. Creating its own technology, in turn, gave the Post more control over things like load speeds and reliability, as well as deep visibility into its users — which stories they read, how far they scrolled, which headlines drew more traffic, and whether each reader has a preference for videos or photo presentations. That information could be fed back to the newsroom in real time, enabling them to, for example, beta-test headlines and optimize photos suited to different models of phones. Though the Post's paper circulation is still declining slightly, its online readership is up 22 percent over last year. Readers are spending more time on the site. And, most critically for marketers, there was a fivefold increase in users engaging with the ads. The Post has said its digital ad revenue now exceeds $100 million annually, growing double-digit percentages three years in a row. Its software is so successful, in fact, the Post has sold it to 22 other publishers, including the Los Angeles Times, Toronto's The Globe and Mail, and Chicago Tribune. Selling its technology is a new business line, Prakash says. "It's in its infancy, we have great aspirations for it, and at the end of the day, what is the point of it? The point of it is, it's a revenue stream to power journalism," he says. When I left the Post in 2008, there was great fear in the newsroom that technology was going to destroy journalism. Now, Prakash says, he believes technology might save it. Jarrod Dicker, the Post's director of ad product and engineering, helped develop software that filters through news stories and automatically places the right ad, to match the user's demographics and preferences. The Post allows its advertisers to use that same software to create more relevant, content-rich ads — things aimed at drawing actual reader interest, as opposed to a mistaken click on an irritating popup or flashing banner ad. "We talk about, in this industry, that ads need to now become user first. Because of hostility with ad blocking and fraud and viewability, we really built this scenario that we need to help build better advertisements or else consumers will never engage with advertising online," Dicker says. If readers are turned off, neither the Post nor the advertiser can win. Dicker says the technology underpins the Post's business turnaround, and it is helping fund investment in the news business. "I wouldn't want to insult anyone in the newsroom, and our journalism is absolutely amazing, but we are 100 percent now, when it comes to competitiveness in the market, a technology company," he says. The result of this technology is not only better targeted ads, but also fewer of them. "If you go to their app, which is a beautiful app, and you pull up their app, it's hard to find any advertising on that thing," says Corey Elliott, a vice president for Borrell Associates, an advertising consultant. Elliott says in the old days, circulation was the big target. Now, he says, advertisers care less about overall subscription numbers or quantifying eyeballs. "That isn't important anymore. What's important is that I get in front of the exact right people," he says. That is exactly what Janel Shervington, media director for ad agency MediaCom, says. "Some time ago, we did view the Post as stagnant," she says. But in the span of a couple of years, her view of the Post has gone from stodgy to cutting edge, and Shervington has doubled her client's ad spending at the Post over two years. She has worked with other news organizations trying to do similar things, but the Post's technology is ahead of the pack, she says. Instead of just buying ad space from the Post, she now partners with the Post on brand and marketing strategy eight months in advance. "We can be comfortable knowing that we're going to be speaking to the right person and our message is going to be getting in front of the right audience," she says.